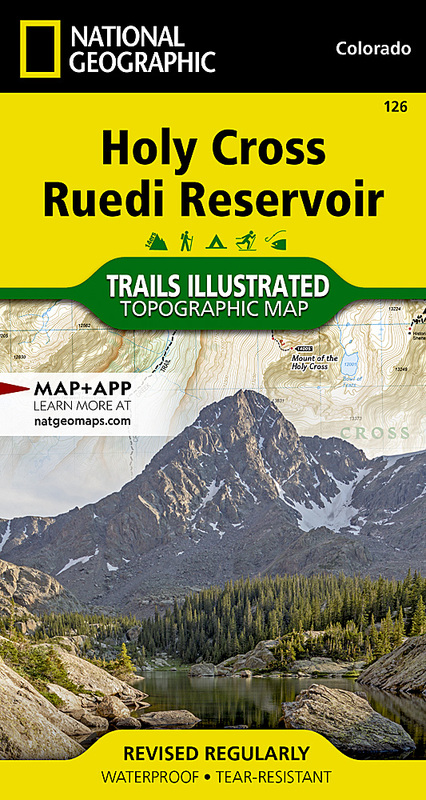 National Geographic's Trails Illustrated map of Holy Cross and Ruedi Reservoir delivers unmatched detail and valuable information to assist you in your exploration of this rugged area. Expertly researched and created in partnership with the U.S. Forest Service and others, this map features key points of interest including White River National Forest, Hunter-Fryingpan and Holy Cross Wilderness areas, Mount of the Holy Cross, Sawatch Range, Turquoise Lake, Sylvan Lake State Park and Continental Divide. Trailheads will lead you to precisely mapped trails with clear mileage indicators and marked according to their designated usage, whether your adventure involves hiking, cross-country skiing, biking, snowmobiling or using some other motorized vehicle. The Continental Divide Trail and Colorado Trail are both highlighted. The map displays contour lines labeled with elevations; passes, peaks and summits; reservoirs, lakes and other water features; and boundaries between public and private land. Some of the many recreation features include campgrounds, fishing areas, including gold medal fishing streams; boat launch points and canoe areas; and 10th Mountain Division huts. Other features found on this map include: Holy Cross Wilderness, Hunter-Fryingpan Wilderness, Mount of the Holy Cross, Red Table Mountain, San Isabel National Forest, White River National Forest.